I am a 36 yr old part-time Registered Nurse and full-time mother of six children ages 5-16, and wife to one amazing man. We live on New Zealand’s Coromandel Peninsula on a 44 acre coastal/bush land block, which has become the setting of The Book of Told (overlaid by a map of the world). I love ‘trying’ to keep fit, my free-range rabbits and now writing. I am passionate about using my time on earth to share Jesus fame and power, and help fight the horrors that are behind human slavery. What inspired you to write The Book of Told: Mere Words? I was in awe of the genius the Great Author used to structure our existence - the complexity and layering - the fact that everything ties in so well to the inevitable and powerful ending. I would sometimes read the comments on CNN articles that consistently turned into a fight against religion and more specifically against the idea of a God. The reasoning was shockingly flawed and small-minded, and I wanted to present a way that it all could have happened. The Book of Told became my written argument for God in my head. It is my preaching to myself of how I have come to know and experience Him as so real and so magnificent – 'closer than our eyes could ever see' according to Matt Redman. This world-history overview came about perhaps also from the timeline we have circling the ceiling of our living room at home. 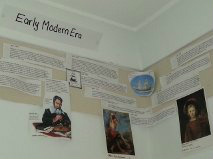 It is a 3-D timeline my children helped me create when we were homeschooling. Seeing the history of our world condensed like that made me realize that our existence is structured similar to a good book: Beginning, climax and ending, and conflict, conflict, conflict. I also needed to do something practical to help people in some way, which is how A21 Campaign came to own the royalties to fight human trafficking. I had been praying for a day-filling purpose because I had recently given up homeschooling to cope with the loss of my brother to Motor Neuron Disease - to be there for my parents during his last stages. The desire never returned to teach my children again as they were in a lovely Christian school with good friends and praying teachers. It started with another of my brothers giving me Louie Giglio's ‘Indescribable’ DVD for my 30th birthday. The God I heard about on screen was the same God I had written on tree trunks to as a child. He was the same God I made up songs to as I clung to him through childhood sexual abuse and resulting early adulthood depression/PTSD/anxiety/eating disorders. He was the same God I fell in love with on so many precious childhood occasions, and the God for whom I tore pages from my bible and rolled them into felt-pen lids to hide in tree trunks by my favorite stream to reread them whenever I needed to—so I wouldn’t be caught and laughed at for carrying a bible around. He was the God who claimed my highest affections because he let Satan mess with my mind and body only so far as a child and no further. He helped me heal. He saw me married to my old highschool sweetheart, after an abusive relationship, and he blessed us with six children who are incredible! From looking back on my life I could not believe how far I had come! And so the story began one night, while I stood by a window, when my husband was sleeping. I could not stop praying and being stunned by God’s glory. Thoughts and desires about how to express this to others began forming in my head, and I began writing down ideas. I knew all along I wanted to do something to portray God’s immenseness, and I was terrible at talking. I saw the project clearly in my mind as a concept (and that it was too ambitious for me) but I had this whisper inside that made me know God could do anything He wanted as long as He had willing workers. At this stage I was too naive to know what would be required. God was wise to not tell me! At this stage also, the concept was very broad and did not have anything to do with an 'author writing a book' theme. Nor did I know I was going to become an abolitionist! From my understanding, your novel is supposed to be a play on words. Was it difficult telling history in that kind of way while blending a fictional tone to it? Good question that I am not sure how to answer. I did not plan to use word play. It happened like this: I was about to start writing an overview of the storyline and needed a pseudonym for God. I was sitting cross-legged in the middle of my bed and simply prayed for God to give me a name that He would be happy with. I looked down beside me, not expecting any great revelation, and saw at the end of a page of a magazine or leaflet, the last word on the page - it was told. With a full stop after it. I thought it was interesting and tested it in my mind and it seemed unusual and quite bold, and then I thought, yes - He is told. He is the one who was, and is, and will be Told forever. I had no idea how important this name would be to the story and how it was the pivotal point and main message. Obviously the entire plot redirected in that moment, and I began to truly see that it was a world-history parable I was trying to write. And it was around this time that I listened to a Beth Moore lesson where she encouraged people to follow their passions and let those passions become their ministries. She said something along the lines of: 'If you want to write then write – I believe the best stories have yet to be told.' That clinched it for me and the stunning realizations that came from the wordplay of the name TOLD throughout the writing kept me on my knees to God during the entire process! - I was tired when I first wrote that and got the giggles so hard I had to stop for the night. And with the ENT word play, well that came from a strange idea I had some years ago to turn our property into a small theme park as we had so many trees. ENT came to represent sin and our entanglements, need for entertainment, and desire for entwine, etc. I am not sure how conventional writers build up their novels, but I suspect not through the strange mess I started with and the absolute need to trust God would pull it all together. And it is happening all over again with a prequel! How long did it take you to write the book and was it smooth-sailing? Smooth-sailing – haha no! Though in a 'sense' it was wonderful. I wrote the first draft in 5 months finishing at 160K words. The writing was the fun part and I do not remember a time when I had no words in those first few months. On the especially good days, I would write 10K words a day and be on such a high when my husband came home from work that he knew by looking at my face that I had had a great session with God. I had to Google ‘How to write a novel’, and ‘Basic grammar’ many times to find out where to start. My first attempt at dialogue was hilarious! I was only average at English in high school, and did not do 7th form, so God had the right person for the job to be sure He shone through it all. I still get seriously confused with basic grammar! It was during the last third of the manuscript that I struggled. Only my husband and the older kids knew that I was writing at this stage. I was too terrified to admit it to anyone else - I had a giant called 'insecurity' speaking to me. I'm only now learning to get my security from Jesus alone. Whether I panicked during this time and looked down at the water I was walking on (as this is what it seemed like), or whether it was a spiritual attack, I do not know - but I began having adrenaline rushes in the middle of the night. I would be asleep and suddenly a rush would come from nowhere, and I would be wide awake for a few hours wondering why I felt so harassed. I began to be sleep deprived and wonder whether I could finish writing. I learnt to pray like I had never before in those days. God never left me – He was right beside me the whole time. I cried so much during that time and when the adrenaline began in the daytime also, I would fall on the bed or floor and weep for God to take it away or hold my hand through it all. I determined to write no matter what (and this is where much of the preachy talk comes from – it was my declaring it over myself that this was the God of power I served and these are the things I have learnt). The entire book is my reminder of things I had grasped and did not want to let go. After 6 weeks of this dark misery, I had to take a low-dose beta-blocker to absorb the adrenaline so I could sleep. I did not want any anti-anxiety medication that might stifle the creativity. It was interesting how God used even this in the book, as this period coincided with the Dark Ages when Brew suffered the most with confusion/insecurity. How did you get through this dark time and are you still struggling now? It was one of those nights that I was overflowing with worship to Him in my sleep after fighting the feelings in my head, and I had woken many times to the same overflow of heart and fallen straight back to sleep in absolute contentment. Then on truly waking that morning, I lay there in that rousing instant with eyes still closed and another song inside, but I knew that something was beautifully different. My hands were resting on my stomach. Jesus was holding my right hand – my writing hand. This was physical in feeling, but more saturating was the bliss and joy and deep, deep, deep peace. It was the most precious moment in my life. He did not have to give me that experience; I couldn’t move for the world. Eventually my husband woke, and I rolled over and told him about it in a vague stunned kind-of way, and I am not sure how he reacted – I know he knew something special was going on - and I held the experience deep in my heart from then on. I felt that God was telling me that He would hold my hand while I wrote. I did not have to fear anything. He had my hand covered. I brought this concept out a little with the experience of Brew when he lost the use of his pen as he had been trying to write his own story, and then when Told gave him it back, Told kept his hand hovering over Brew’s own in the battle scene so only what Told wanted in his story was written. That lesson was for me. I still try so many times to take control again. It leads to ugly situations! We are words that need positioning by God Himself to create powerful statements for Him in the story which is for His glory alone. Am I still struggling now with the anxiety rushes? Only at 5% what I had. Just enough for me to always cling to God and never ever think I could try to write alone. The struggles I have now I am thankful for, and I know God has left them for a reason and can take them in a moment. Also, I have recently been to hear Dr Caroline Leaf (Sistas Conference Auckland), and I now understand how the human brain is wired to worship God and renew itself from toxic thoughts. Childhood lies over my identity are currently being destoryed and new thoughts are forming a pattern for my life as a true child of God and all that entails! God calls us to take captive every thought and genuinely wants to renew our minds! Since you’re a lover of history, if you could do back in time to your favorite history era/event/period/etc. where would you want to go and do? I would love to have seen Jesus on earth. I would love to soak in the sheer genius he used to write Himself into his story. I would want to feel every emotion as I travelled through his magnificent birth, the wisdom of his teachings, and his tragic yet most powerful death and resurrection. I would love to look him in the eyes and know that we were all thought of in his mind before the first word in his story was ever penned. But then I remember that we are the ones who are more blessed than those who lived in that time, because we believed without seeing—and that blows my mind! One of my favorite things about Christian authors is the Biblical message is weaved into the lives of the characters. Is there something special that God taught/showed you while going through the process of writing The Book of Told: Mere Words? He taught me to trust deeply that what might not make sense in small messy snippets of thought, can come together to form a powerful message under His influence. I have come to live in awe over God’s genius penmanship in creating our world, which outlines his written answer to the problem of sin (entwine in the book) and his great invitation to reality; and that we are mere words within a preplanned plot, and that he told the story to his own characters via multiple clues throughout their lives. It is having this perspective of God looking back at us that lifts us above the traps of this world that force us all useless, and this message will remain with me forever. I could imagine you had to do some research for this novel! What was one of the most interesting/fascinating things you learned or relearned? As I, terrified of failure and in utter secrecy, wrote those first words, the story seemed to change as I wrote. So no, there was not much research needed for this novel as its historical themes are all in broad concepts of the mind that jumped out the deeper I wrote. I already had the timeline on our wall which showed me the breakdown of the eras and which life objects could be found at certain periods. Yes, I did have to keep open my googled search for ‘grammar terms’ and ‘how to write a novel’!! With this being your debut novel, what advice would you give to aspiring writers? Write with a deep purpose in mind—about what you know, about what you are passionate about—it will fuel you like nothing else when it all seems too scary. And don’t cry when the editor makes suggestions. Trust their expertise! How can readers support and/or pray for you, K.A.? Oh please pray for the words of this story to rise above my flaws and take on the true depth of meaning God intended. Pray with passion that even a few slaves might find freedom through the hard work of A21 Campaign and Passion City Church, and that the words themselves might bring another kind of freedom to someone who needs to hear of Jesus name. Also pray for a covering over me as I begin the writing of the prequel, now that the backbone has been formed. Most importantly, consider supporting A21 Campaign and using their resources to educate your nation on the horrors of human trafficking. Behind this organization are amazing men and women of God who are gifting their skills for the freedom of others. There are more slaves now than in any other time in history, and we can all do something to help them. I passionately want to be part of seeing New Zealand becoming the first country in the world to be slave-free! I know we can do it! What’s next for you in the writing world? As mentioned above, the prequel! The groundwork is complete and some of the scenes are prewritten. A21 Campaign will have the signed over royalties for this novel too. And the themes are powerful!! I am pretty excited to be given the passion and honor of writing another book. Lastly, where can readers find you online?